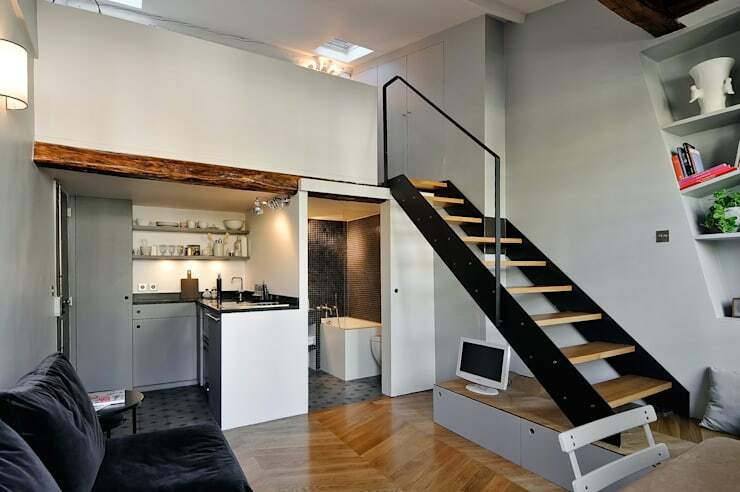 A little old apartment spanning a minuscule 22sqm could easily be overlooked in many cities. 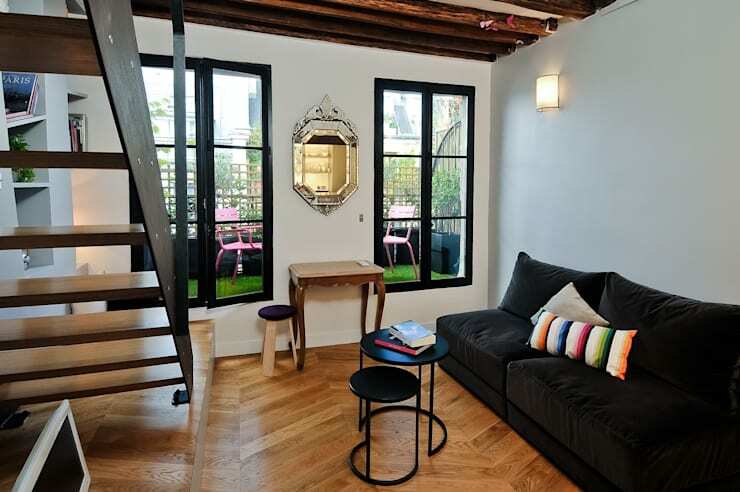 But when it happens to be located in Paris, a city with sky-high property prices, it's definitely worth a stylish makeover. Small homes, particularly one as small as this, really need to feel easy to move around. The passageways and doorways often benefit from being a little wider than normal and there should be a very uncomplicated series of traffic zones throughout the home. Here, we can see how the designer has achieved this by building a sturdy staircase with a very gentle incline. This will generally take up more floor space, but she has cleverly avoided the issue by building a storage platform as a base. It's hard to believe, but parquet floors went out of fashion for a long time. While they were once seen exclusively in aristocratic old homes, they are now appearing in modest little dwellings like this. The living room here is somewhat eclectic, so it tolerates a range of three different wooden finishes; from the floor to the dark wooden staircase and lovely old exposed ceiling beams. Note how the wooden elements give some dramatic contrast to the light white base. 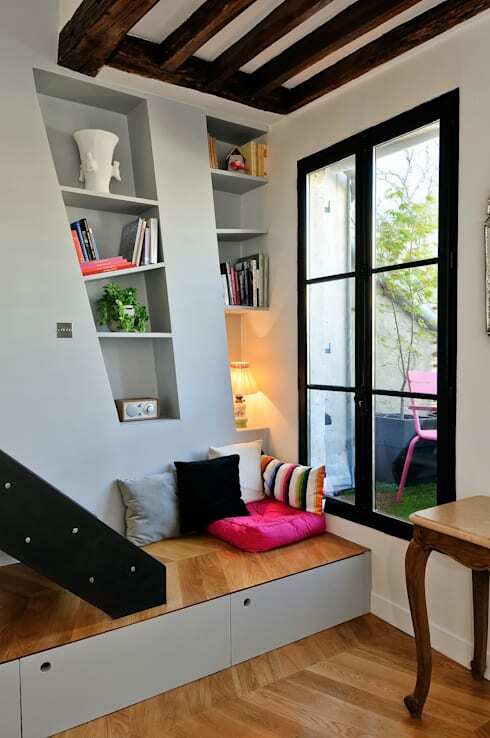 Limited floor space should never ever be an excuse for a lack of style! Here we have some totally unique and skewed built-in bookshelves. They are shaped like trapezoids—even the bookshelves are somewhat askew! Also, check out the simple storage underneath the platform and the cute little reading corner, it's utterly simple and very cosy looking. When looking to style up your balcony, astroturf is not the first thing that comes to mind. 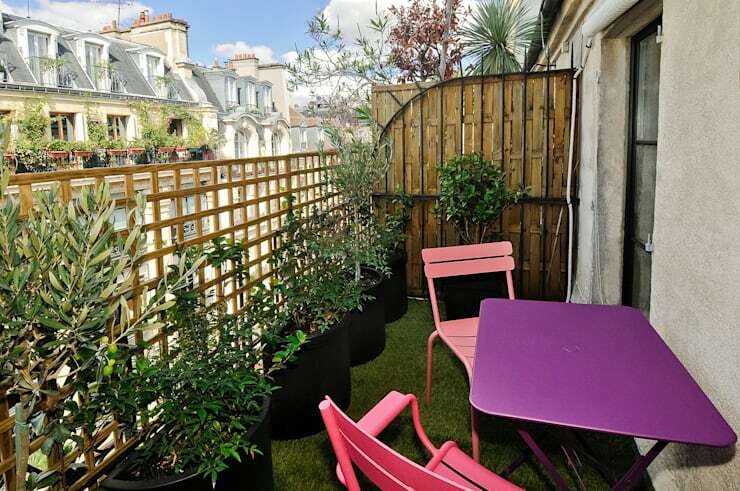 But it's a perfectly practical material that can really amp up the green effect of a little balcony. It's not delicate so you can place your balcony furniture on top and make the balcony green from wall to wall. Also, we love how the wooden trellis and big potted plants create a whole lot of privacy. This small balcony is quite low-maintenance for such a green little sanctuary. In a small home with an open plan layout, each living zone really needs to complement the overall theme. 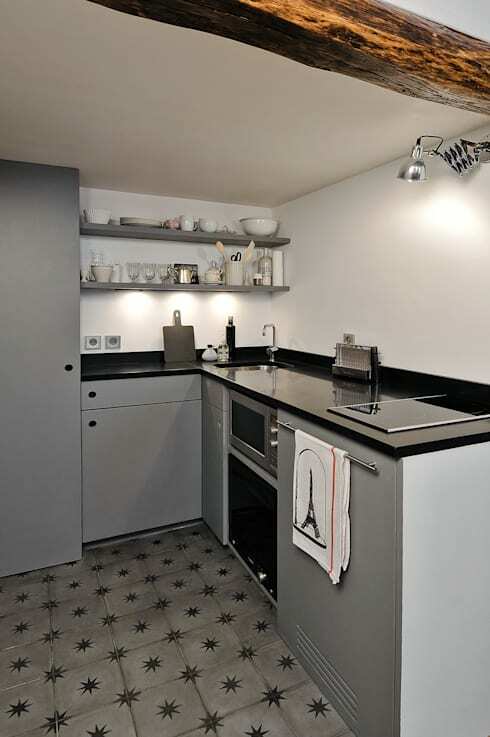 So this little grey kitchen may seem a little subdued on its own—but it works perfectly within the larger space. The black countertop also adds some strong contrast that reflects the black of the big door-frames in the living room. Check out the grey antique style floor tiles! 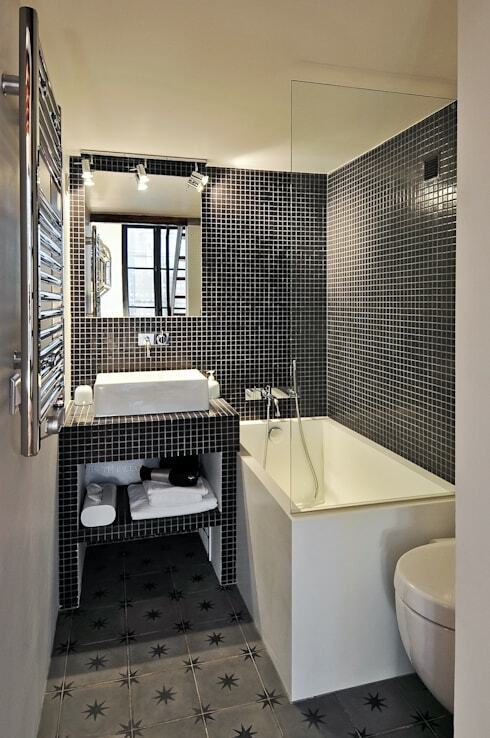 Despite the lack of floor space, the small bathroom has a very abundant feel. This is due to the installation of a very deep bathtub. The small black and white tiles also run all the way up to the ceiling. Finally, the mirror has been placed to reflect light from the open window and there is a clear shower screen to make the small bathroom feel bright and open. Finally, we come to the lovely little sleeping platform. 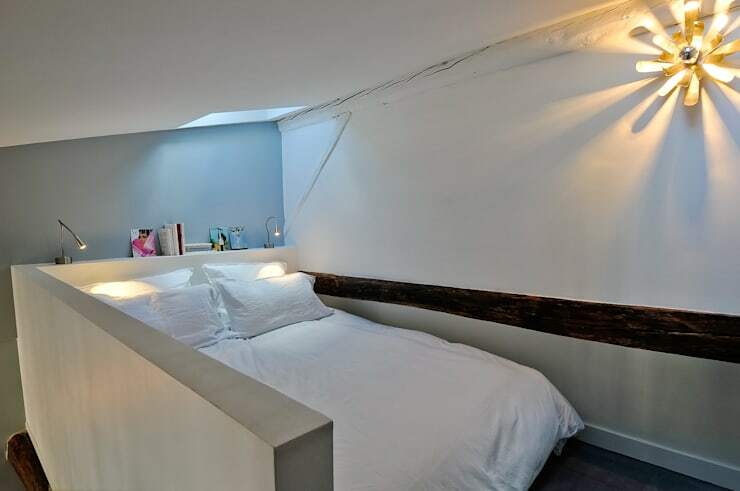 It fits snugly within the boundaries of a mezzanine whose walls also double as a shallow shelf and nightstand. This home is located on the 6th floor of the building so it has the wonderful advantage of a roof light or skylight. For more architectural adventures, have a look at Cheap and chic: Abandoned container turned into a cool home. What's your favourite feature in this small home?